OVER 25 BLUE WATER BOATS ON DISPLAY! Were you disappointed to hear that Broker’s Cove is no longer being hosted by the United States Sailboat Show? We were too! 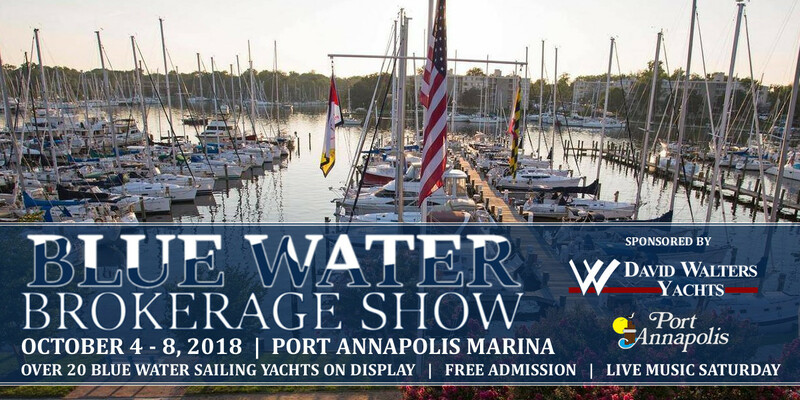 Therefore, David Walters Yachts is proud to present the first ever Blue Water Brokerage Show where we will be featuring over 20 of the finest blue water sailing yachts at our office located at Port Annapolis Marina! There will be boats for all budgets, styles, and preference, so come on out and join us during your visit to the United States Sailboat Show! Would you like to enter your blue water boat in the show? We are always looking for high-quality yachts to represent and would love the opportunity to showcase your boat. For details - contact Amanda Noon at (954) 527-0664. Jeanneau Sun Odyssey 43 DS "Inquiry"
Hinckley OC 40 "Shining Star"
Catalina 36 MKII "Starry Nights"
Pacific Seacraft 31 "Bella Luna"
Bristol Channel Cutter 28 "Pinocchio"
Bristol Channel Cutter 28 "Sadie"